You can also read this report for more information on New York City, Madison, Wisconsin, and Minneapolis, Minnesota. And this spreadsheet provides a list of all of the current state and local policy initiatives related to worker cooperatives that we are aware of. Contact us at info [at] institute.coop if you have updates or corrections! In June of 2014, the New York City Council voted to approve a $1.2 million initiative to fund the development of worker cooperatives. The initiative was driven by council members and will be funded from City Council’s discretionary funds, not the administration’s overall budget. The funds for the program are being allocated among groups already developing cooperatives in New York City to build their capacity. The groups are also working to help business owners interesting in selling their businesses to their employees and to explore an anchor institution strategy. Coalition members include the New York City Network of Worker Cooperatives, Center for Family Life, Democracy at Work Institute, Green Worker Cooperatives, Make the Road NY, The Working World, ICA Group, CUNY Law, Urban Justice Center, Bronx Cooperative Development Initiative, New Economies Project, Workers Justice Project, and the Federation of Protestant Welfare Agencies. 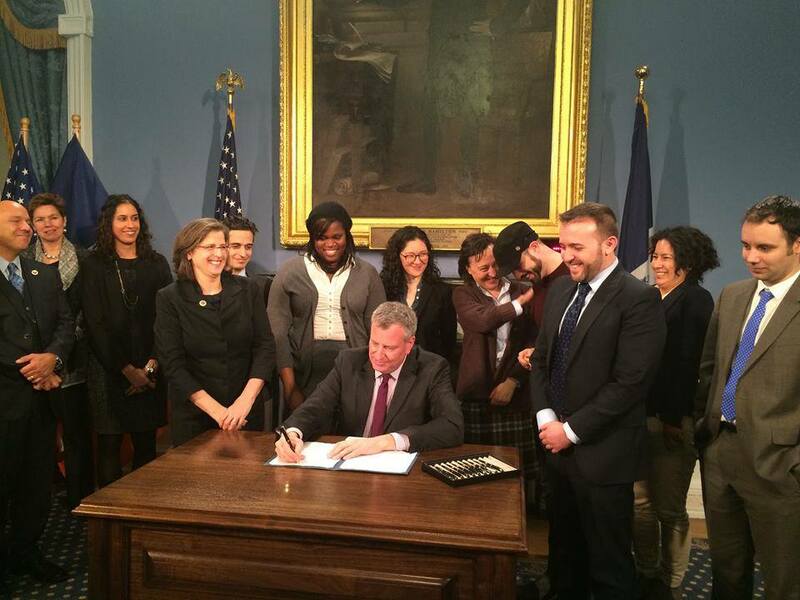 In March of 2015, New York City continued its support of worker cooperatives, signing into law the first ever piece of city legislation to require a city’s economic development arm to track municipal support of worker cooperatives. The bill was championed by Council Member Helen Rosenthal with support of Council Members Maria Carmen Del Arroyo and Carlos Menchaca. The bill, Intro. 423, will require the city to assess how it can better support worker cooperatives, as well as report on the number of city contracts awarded to worker cooperatives and the number of worker cooperatives that received assistance from the Department of Small Business Services (SBS). Moving forward, the coalition of worker cooperative groups will seek additional policy changes to increase opportunities and lower barriers for worker cooperatives, including procurement preferences that will help worker cooperatives participate in the $1 billion spent by the city annually on goods and services. After several years as the Austin Cooperative Think-Tank, the Austin Cooperative Business Association (ACBA) was formed to provide coordinated support for the growing cooperative community in the city. ACBA, a joint project between Austin-area cooperatives of various sectors (including consumer, housing, financial and worker) and the National Cooperative Business Association (NCBA), aims to benefit and expand cooperative businesses in Central Texas. Launched in 2008 by a working group of Cleveland-based institutions - including the Cleveland Foundation, the Cleveland Clinic, University Hospitals, Case Western Reserve University, and the municipal government - the Evergreen Cooperative Initiative is working to create living wage jobs in six low-income neighborhoods through worker cooperatives. The businesses include Evergreen Cooperative Laundry, the greenest industrial laundry in Northeast Ohio; Ohio Cooperative Solar, which provides solar installation and energy retrofitting; and Green City Growers, a 10-acre hydroponic greenhouse that will supply grocery chains, wholesalers, and food service companies within a 150-mile radius. In November of 2014, the City of Madison approved a budget initiative allocating $5 million to cooperative development, where $1 million would be available each year for five years starting in 2016. Madison’s mayor, Paul Soglin, who is a long-time supporter of cooperatives, spearheaded the program, motivated by the work being done in New York City. City staffers are currently working with cooperative developers and other partners to figure out how to best allocate the funds. The diverse coalition of partners includes the University of Wisconsin Center for Cooperatives, the South Central Federation of Labor, and other Madison-based cooperative developers, unions, trade associations, finance institutions, and economic and community development groups. There is also strong interest from the many cooperatives in the City of Madison. In the first year, the money will most likely be used to create a loan fund that will offer low- or no-interest loans to cooperatives for the following purposes: (1) financing conversions to cooperative ownership, (2) financing the creation of unionized worker cooperatives (3) providing start-up capital for cooperatives in all sectors, and (4) community problem solving through cooperative development. This last category would offer both loans and grants to address issues such as employment options for formerly incarcerated individuals or building wealth for workers in high-growth, low-income industries. The organizers are working now to determine how much of the money will be used for technical assistance and what other groups may donate to both the loan and technical assistance fund. It is important to note, however, that while the funding has been approved, it is not guaranteed, and may be reduced or removed from the budget altogether. Although this is by far the largest commitment of city resources to cooperative development, the budget initiative is not the first time Madison has supported cooperatives. In the late 1970’s the City worked with a variety of groups to help the creation of Union Cab, a worker-owned cooperative and founding member of the US Federation of Worker Cooperatives. In 2012, the city sponsored a day-long cooperative development conference, and the city has also worked with developers to support the creation of a food cooperative in a low-income neighborhood.